View More In Wiring Harnesses. The Tusk UTV Horn & Signal Kit without Mirrors is designed to be a simple way to provide front and rear turn signals, horn, license plate mount, for your UTV. The Tusk kit is easy to install with a few common tools. The components have universal applications and will work on almost any UTV. 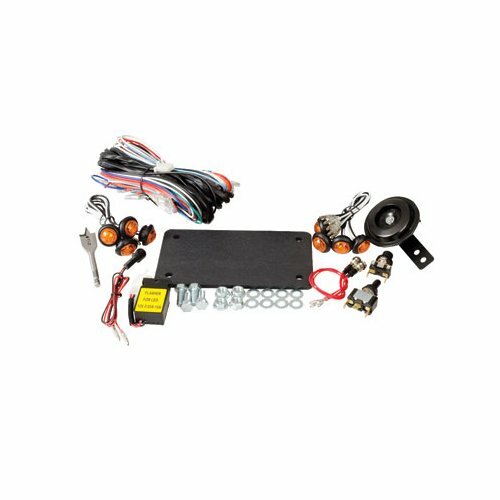 Kit comes complete with wiring harness, LED front and rear turn signals, flasher relay, horn, mirrors, license plate mount, horn button, and blinker switch. Always refer to your local and State laws if you intend on using this kit to make your UTV "street legal"
Always refer to your local and State laws if you intend on using this kit to make your UTV "street legal". Depending on the laws in your area, this UTV kit may or may not comply with "street legal" requirements. The Tusk UTV Horn & Signal Kit without Mirrors is easy to install on your side by side.